My response: “What about it?” How many people are working in nursing homes today who have never had a course in gerontology? 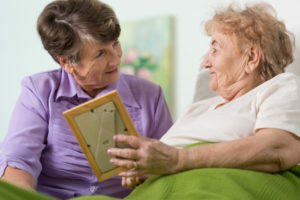 How many people are on nursing home floors right now providing cares for which they received no training or the person before them “trained” them in “this is how I do it.” How many lawsuits are currently being levied at long-term care facilities. Now before you send me your email about how many great people are working in nursing homes, save it. I know this from first-hand experience. In the 25 years or so of working with the long-term care community, maybe I’ve met five people who I thought were in the wrong job. With that said, I know from experience that there are people in our communities that are willing to be thoroughly vetted and trained being motivated not by the need for income but rather their need to engage in a meaningful way by giving back to their communities while sharing a passion for serving older adults. I would suggest that this person, this volunteer, will present less of liability problem than paid staff. Now if you’re going to send me email about volunteers replacing paid staff, save it. We’re now approaching 1.2 million vacancies in long-term care staffing. The ship is sinking. We need all hands on deck. We need to take advantage of every resource that is available to us, to include what I call “trusted” volunteers. Ok, go ahead send me your comments and emails anyway.